Patagonia Adventures started exploring the Puelo River (Rio Puelo) system in 1988 and found the remote lakes, rivers and streams an excellent location for fly fishing. At first, a well arranged camp was constructed for anglers, who wanted a Patagonia pioneer experience into these virgin waters and catch trout that had never seen the imitation fly before. Later, from the camp situation a lodge was built. Thus, the Alto Puelo Fishing Lodge was born. It was built at the headwaters of the Rio Puelo and a few short steps to the river in order to provide a more pleasant and comfortable accommodation. Building a fishing lodge or any type of building, in a mountainous terrain where no roads exist, is a painstaking and patient endeavor. Many of our clients ask us how we got all the building materials here. A combination of ox cart, airplane and boat has been the bulk of the transportation of not only the materials for this lodge, but also for our clients. The Alto Puelo Lodge is constructed of local cipres (cypress) logs, cut and hand fashioned into an attractive structure. It over looks the Rio Puelo and the Andes Mountains, giving you a view of the many kinds of birds and wildlife as well as trophy trout jumping out of the water. The Puelo area was first populated many years ago by pioneers who developed small farms. 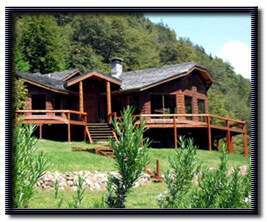 The farms are nestled on the side of mountainous terrain hidden among tall Coihue trees. The common tool was the axe and the main mode of transportation was oxen and cart. The ox carts today, are still made by hand. Because of the need to travel for supplies, horse trails were carved into the virgin soil and thus isolated valleys began to be linked. Farmers with their horses and ox cartstraveled from the small village of Segundo Corral, Chile to El Bolson, Argentina for flour, oil and other basic needs. The pass came to be known as "Paso El Bolson", and is used by vaqueros even today. The grandsons of those pioneers now live on the farms. Not much has changed from early days as they still carry on the traditional life style with their horses and ox carts. At the rivers edge is our 150-acre farm. The Alto Puelo Lodge (Patagonia Adventures) provides garden fresh vegetables, herbs and local fruits for our clients and guests. During the growing season, the farm's produce are used daily by the chef for your meals. The reddish brown colored lodge has private baths for each room upstairs with the main room a commanding view of the river and mountains. You are always invited into the kitchen where the old wood stove warms the morning coffee and converse with the chef on what is on the menu for lunch and dinner of which maybe your prospective caught trout could be the subject. Daily activities can be enjoyed besides relaxing. Fishing is just outside your door and if you like hiking and exploring the many wonderful trails. Some of the trails will lead you to farms where you will meet pleasant folks (either traveling by horse or ox cart) who will welcome you with the cordial "buenos dias" . Other trails will bring you to rarely visited lakes or streams. Your official tour guide (Jack, the black friendly Labrador) will usually accommodate your hikes. E-mail Eric at eric@argentinachileflyfishing.com for more information about the fly fishing and other activities available at the Alto Puelo Lodge.